Often Hollywood films and American TV shows skew how we think about certain job professions, be it the role of teachers in their inspirational nature of students or the quality of a priest in solving murders. With bomb disposal people we often see a the cop sat in front of a load of wires and an old-looking alarm clock, with their blade they inch their shaky hand closer to the blue wire, sweat dripping down their face until…the moment comes, the snip the wire and the timer stops. The reality however, I have to assume, is a lot more tedious, complicated, scary and above all else; stressful. 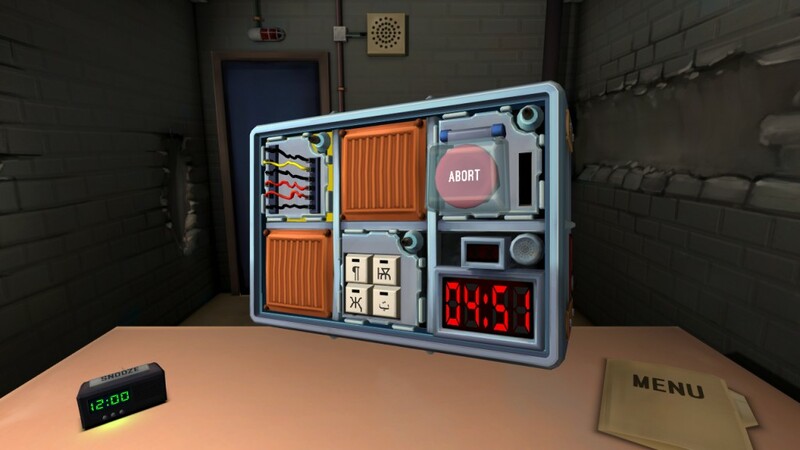 Keep Talking and Nobody Explodes looks to bring bomb defusal to gaming without it being “Hold X to defuse” or a quicktime event. 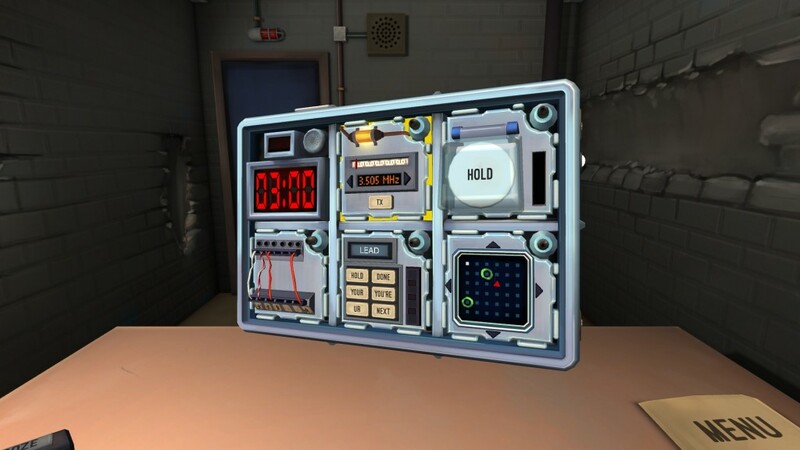 Instead it wants you to solve puzzles and perform memory games before you virtually explode. What’s so hard about that? 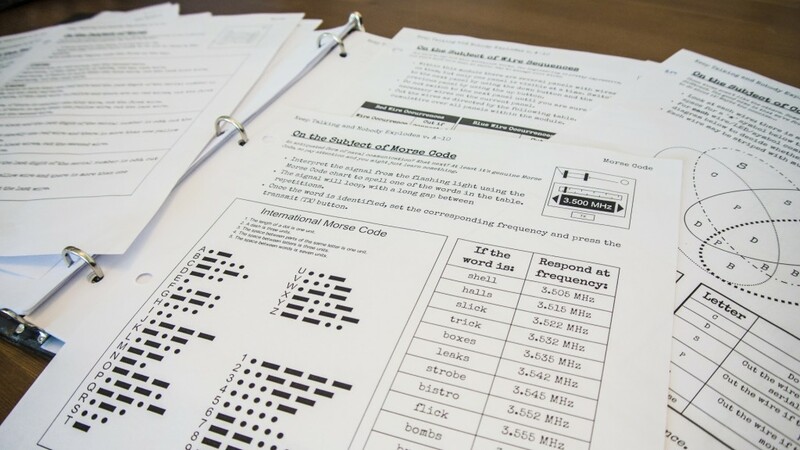 Well returning to the Hollywood version of events in bomb making often they’ll have their partner on a walkie-talkie telling them which wire to cut, what you don’t see is the huge bomb defusal manual that they have to flick through to find relevant information, don’t worry, Keep Talking and Nobody Explodes has your back on this with a real world 25 page booklet for all your bomb defusal needs. Keep Talking has a huge gimmick working in its favour, not only are you dealing with a virtual bomb in a virtual world, a friend is going to have to be in communication with you and have a hard copy manual nearby. The bomb defuser is presented with a case, inside there is any number of ‘modules’, each module contains a different puzzle. One may contain a series of symbols on buttons. The player must relay this information to their partner who is not looking at the screen and then decipher from the wonderfully complicated manual which order the buttons should be pressed, once the correct order has been entered the module turns green and it’s onto the next. All the while the defuser and the partner with the manual must remember that they only have limited strikes and limited time before the bomb goes boom. This game would be interesting just on the face of it having this bomb defusing series of puzzle, but throw in the blind partner and the need for heavy clear communication and suddenly you have an even more fascinating concept for a title. I’ve seen it described as a party game and a mini-game puzzler, but to me there’s another way to look at it, this game is wonderful example of a virtual boardgame, something that with it’s reliance on communication and hard copy manual you’ll want to be playing when you have a few friends over for games night. There’s a ‘campaign’ mode where the game slowly but surely over the course of a number of missions gives you more to learn, more to understand and more to screw up. If that’s all a bit to regimented for you and your nerves of steel then you can go into free mode and set how many modules you need to diffuse and how much time you have to achieve this. From wire cutting to a cryptic Simon Says game, the various modules will test your ability to stay calm and to communicate with your partner in anti-crime. I took a major risk and gave this game a go with my partner, we took it in turns jumping between diffuser and manual reader, very quickly we realised I was rubbish with the manual and couldn’t even understand instructions let alone verbalise a response that was cohesive or in fact accurate. This is a game that has the potential to cause friendships and relationships to take a hit, but when you pull off a clean run on a bomb and take on hard puzzles and manage to get things sorted with relative ease you both feel unstoppable. This game will bring you together, just be aware that it could also smash you apart. Whether you’re the one on the computer looking at the device on the table or you’re the partner ‘radioing in’ instructions like “If there is a vowel on the serial number and no yellow wires cut the first blue wire”, you’re going to feel like you’ve just take on the world and succeeded; this feeling is unjust, there is no bomb, there is no danger, unless you’re roleplaying heavily, but you still get a rush from the whole experience. There’s no way to play this on your own unless you want to look up things yourself, so if you know you have someone nearby or on Skype you can get in touch with then this game is a must, it’s fun, chaotic and satisfying. Just be aware you have to download the manual from www.bombmanual.com and even just reading that has put us all on a government list somewhere…don’t worry though, it’s worth it.